Hong Kong can be considered as one of the world’s most iconic cities. It is famous for its culture, food, shopping destinations and tourist attractions. Some of these famous attractions include Ocean Park, The Peak Tram, The Star Ferry and the most magical place, Hong Kong Disneyland. It was year 2012 when Jen and her sister spent a 3 day and 2 night stay in Hong Kong. They purchased a package tour for P8,100 [approx. USD $200] that included hotel accommodation, daily breakfast, and city transportation. It was the most convenient way for them to enjoy their visit since it was their first time. Anyone with a good sense of direction has the option to tour by themselves since maps are available at the airport or the hotel for free. The first place that they visited was the TSL Jewelry Factory. It is one of the biggest Hong Kong chains that specializes in jewelries that are made out of platinum and pure gold. The jewelries were all sparklingly beautiful, but they found the tour to be very boring as they were not really into jewelries. After spending an hour or two at the shop, they headed to the AW Factory where they bought t-shirts and cupcakes at a very reasonable price. After buying some souvenirs, they went to the Avenue of the Stars. 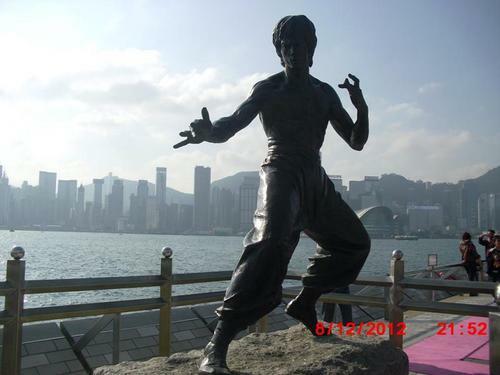 It is an attraction in Hong Kong that pays tributes to outstanding professionals of the Hong Kong’s film industry like Jackie Chan and Jet Lee. 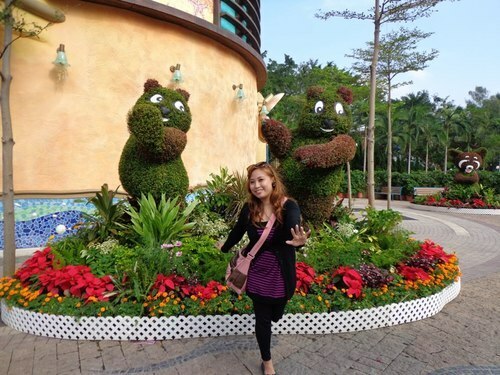 At around 2:00 PM, Jen and her sister headed to the most enchanted place in the city: The Hong Kong Disneyland. The park consists of six themed areas which are U.S.A., Adventureland, Fantasyland, Toy Story Land, Grizzly Gulch and Tomorrowland. They got the chance to watch a theater play of Mickey Mouse and his friends. It brought both sisters plenty of childhood memories. The Toy Story World is also one of the beautiful parks that they have explored. “The place was really magical. We had fun at the Toy Story World where you can see all the miniatures and statues of the characters from the Toy Story movie. We did not attempt to ride the roller coaster because it scared me a lot”, Jen said. The best ride that they have experienced is called It’s A Small World. It is one of the highly recommended rides where guests can see over 300 audio-animatronic dolls that are dressed in different national costumes. The dolls sings “It’s a small world”, a theme of international unity and global peace. The song is translated in different languages, including Jen’s native language which is Tagalog. “We were very amused on how the dolls and their costumes were set up. I recommend this ride, especially to those who have kids”, Jen added. The next day, Jen and her sister went to the Ocean Park. It was not included on their tour package, but they decided to purchase it so that they could maximize their stay in Hong Kong. The tour cost HKD 380. “We had a great time on this tour. We’ve seen different animals that we don't normally see like dolphins, sea lions, big bears, and different kinds of jellyfish," Jen said. Ocean Park has a huge aquarium where people can witness the life under the sea. Jen and her sister were able to observe the sharks at a close glance without the fear of being devoured. They were also able to stare at different school of fishes without scaring them away. It made Jen and her sister feel like they were part of the sea. A variety of rides can also be found in the Ocean Park. One of these is the cable car. “Riding the cable car was fun and scary at the same time. My sister and I have a fear of heights, so we really tried our best not to look down. I chanced a few glances and saw how high our location was. Riding the cable car had given us the chance to have a better view of Hong Kong, especially the seaside. Everything was breathtakingly beautiful," Jen said. Aside from exploring the fascinating places in Hong Kong, they also tried the food around the city. Jen and her sister allocated a budget of HKD 250-400 for their food. There were a lot of affordable restaurants in the area and the food typically only cost around HKD 20-50. They walked around and tried the foods that the locals sell along thr streets -- what is usually termed as “street food” in the Philippines. They ate hot dogs covered with bacon, squid balls, etc. They came across this food stand where a seahorse on a stick were being sold. “We did not attempt to try it out because I couldn’t bear the thought of eating a seahorse. My friend who went once in Hong Kong told me that eating a seahorse is like eating sand. It has a texture similar to tiny granules," Jen said. Jen describes the food in Hong Kong as bland and not too tasty. “I think they use little MSG. Chinese rely more on natural flavors. One specific example was the food that they served us in Mcdonalds HK. Their burger patty is not as tasty as we have it in Manila, although I still appreciate it since they serve bigger portions with natural spices on it. Noodles have a bigger portion as well. Maybe because it is their staple food in Hong Kong," Jen explained. She also noticed how the locals from Hong Kong were different from the people in her homeland. “Some of them are quiet, do not smile a lot and have a blank expression. They also have difficulty in speaking and understanding English. But generally speaking, I can say that the people there are nice and friendly," Jen commented. Overall, Jen describes her stay in Hong Kong as fun, exciting and adventurous. She is planning to visit Hong Kong again sometime soon. She will not purchase a tour package this time because the places that she would like to see are not commonly available on the packages that are being offered. The two most sought places that she is planning to visit are Nan Lian Garden and Ten Thousand Buddhas Monastery. Nan Lian Garden is a chinese classical garden with beautiful water features, wooden structures, hills, rocks and trees. Ten thousand Buddhas Monastery, on the other hand, is one of the most famous Buddhist temples in Hong Kong. These attractions manifests the exquisiteness of Hong Kong that will truly lure any person to keep coming back for more thrilling and amusing experience.